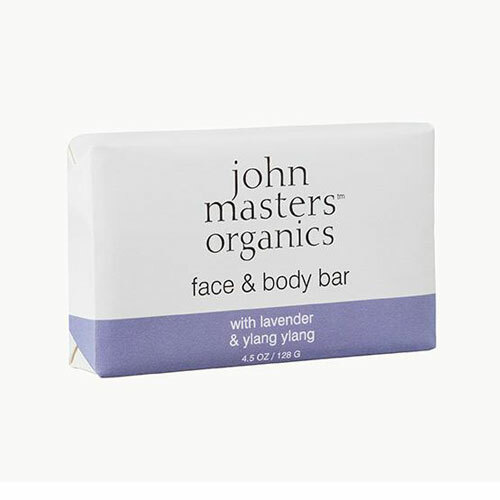 John Masters Organics Lavender Rose Geranium & Ylang Ylang Soap is triple-milled and enriched with moisturising olive oil and cupuacu seed butter. Calming lavender, sweet rose geranium and exotic ylang ylang essential oils sooth and purify skin while palm and coconut oils deeply condition and soften. Ideal for the face and body. Sodium palmate*, sodium cocoate*, aqua (water), glycerin*, olea europaea (olive) fruit oil*, sodium citrate, lavandula hybrida oil*, pelargonium graveolens flower oil (geranium)*, cananga odorata flower oil (y;ang ylang), theobroma grandiflorum seed butter (cupuacu)*, tocopherol (vitamin E), citral+, citronellol+, geraniol+. Below are reviews of Lavender & Ylang Ylang Face & Body Bar - 128g by bodykind customers. If you have tried this product we'd love to hear what you think so please leave a review.